Have you had difficulty using a USB to RS-232 adapter to connect your RS-232 device to a computer? If so, you are not alone. Our customers frequently encounter issues with these adapters. In this article, I’ll briefly discuss the origin of these issues and provide you with some suggestions for successfully handling them. In the old days of personal computers, one of the primary connections available was the RS-232 serial port. Apart from the parallel port, it was the primary means to connect an external device. The connector was reduced from a 25-pin connector to a 9-pin connector, but RS-232 ports remained present on every computer for many years. Built-in RS-232 ports featured direct mapping to memory and worked at a high priority. Data practically flowed directly to and from the software that was accessing the serial port. In 1996, the Universal Serial Bus (USB) standard was introduced as a replacement for the serial connector and other connector types that were typically found on the back of computers. The USB provided smaller connectors and more data throughput than the serial and parallel interfaces it replaced. USB devices have high throughput, but they use a shared data bus. Data is wrapped up and transferred in packets. 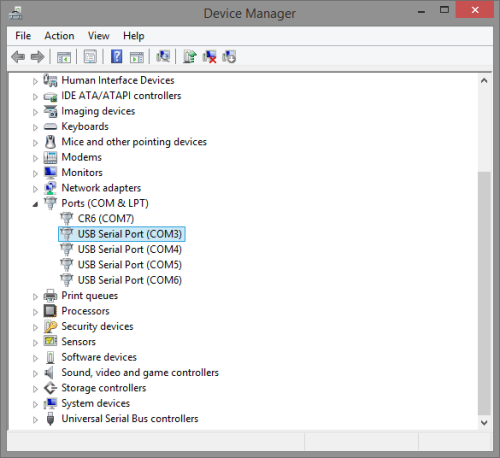 To handle the packets and move data in and out of the program accessing the USB device, a software driver is needed. The software driver sits between the hardware and the computer program you are using, and it must be installed and working correctly. With the widespread adoption of USB, most computers sold now do not have an RS-232 port. Therefore, to connect an RS-232 device (such as a CR1000) to a computer, you need to use a USB to RS-232 adapter, such as the 17394 converter. The most common problem that our customers encounter with a USB to RS-232 adapter is getting the proper driver installed. 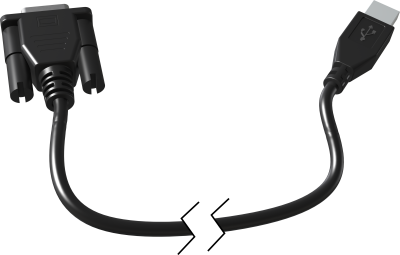 The driver must correspond to the chip inside the cable—not to the manufacturer of the cable. Tip: Test your USB adapters in the office with your field computer. When you are in the field, your computer won’t have an Internet connection to automatically download and install the driver. In the Windows Device Manager, right-click your device from the list. In the drop-down menu that opens, select Properties. In the Properties dialog box, select the Details tab. In the Property field, select Hardware Ids from the drop-down menu. In the Value field, there is both a VID (Vendor ID) and a PID (Product ID). These IDs respectively indicate the manufacturer and the model number of the chip. In the example above, I did a quick Internet search for VID 0403 PID 6011, which revealed to me that the chip is an FT4232 manufactured by FTDI. After you know your chip type and manufacturer, you can locate and download the correct driver for your version of Windows. USB to RS-232 adapters are commodity pieces of computer equipment. As much as we all wish that everything was as reliable as the CR1000, all adapter cables eventually fail. Although there are two primary companies that manufacture USB to RS-232 adapter chips, there are many cable manufacturers who offer varying levels of cable quality. Higher-quality, industrial models should last longer, but they wear out over time—just like any field tool. I have seen several cases where old cables could no longer handle 115200 baud, but the cables still worked on low baud rates. There have been many more cases where a USB cable stopped working half-way through a day in the field. Tip: If your field site is far from your office, take two USB to RS-232 cables with you. Lost time in the field can be a lot more costly than the purchase price of a second cable. 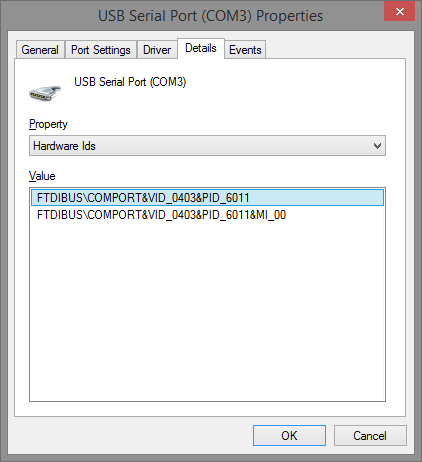 As mentioned previously, USB uses a shared data bus with packetized communication. The packetized communication introduced some latency (data transfer time) that wasn’t present with built-in RS-232 ports. Unfortunately, latency makes a noticeable difference when you download large amounts of data or upload a new operating system. From the Windows Device Manager, right-click your device from the list. In addition to lowering your latency time, I also recommend disabling the Selective Suspend option for your cable. The Selective Suspend option allows Windows to put your hardware to sleep, which can result in corrupt data packets. To disable the Selective Suspend option, clear the checkbox for the Enable Selective Suspend field on the Advanced Settings window for your device. 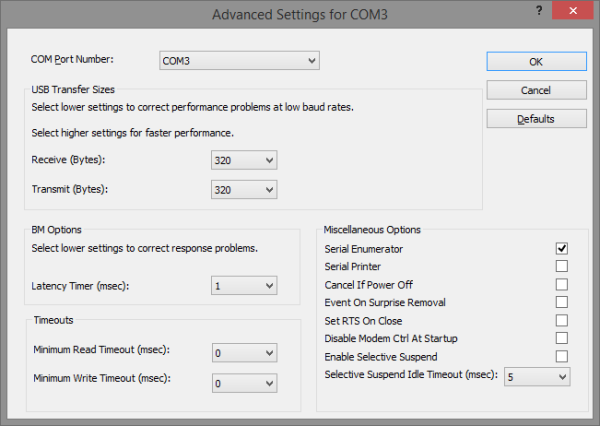 Note: The Selective Suspend option is already disabled by default in the FTDI driver. Newer data logger designs, such as the CR6, feature a native USB connection. Many devices, however, will feature RS-232 connections for years to come, and we’ll need to continue using USB to RS-232 adapter cables. I hope the suggestions I’ve provided help. Feel free to share any USB to RS-232 issues that you have encountered by posting a comment below. Ok, but my cable is Prolific PL-2303 XA. How I improved the performance? How I reduce latency time? The drivers provided by Prolific do not allow adjusting the latency. It is recommended to only use cables with FTDI chips for connecting to Campbell Scientific equipment. The cost difference in cables is very small.